The Verdict: The Truly Simple® Credit Card from Fifth Third Bank is a good option for making big-ticket purchases that might take more than a year to repay. Truly Simple’s top perks are its 0% introductory APR, which lasts for the first 15 months your account is open, and its lack of an annual fee. Both features compare favorably to most other offers. For example, the average credit card has a $17.35 annual fee, according to WalletHub’s Credit Card Landscape Report, and the average 0% period lasts for about 10.6 months. But you’d better make sure to use a credit card calculator and repay what you owe before regular rates take effect. Because despite requiring at least good credit for approval, Truly Simple’s regular APR could be above average for even someone with fair credit. By the way, you can check your latest credit score for free on WalletHub if you’re unsure whether you meet the cut. 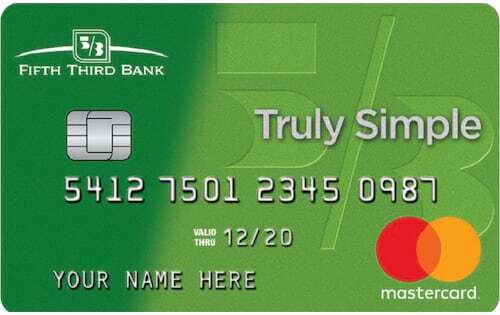 The Truly Simple Card offers a 0% balance transfer APR for the first 15 months, too. But a balance transfer fee of 4% or $5, whichever is higher, sullies that side of the deal a bit. So the card isn’t as attractive for people with existing debt as folks who want to avoid interest on upcoming balances. Finally, the Truly Simple from Fifth Third Bank Credit Card does not offer rewards. So this definitely is not the card for someone who plans to pay his or her bill in full every month. If you’re in the market for a rewards card, you can’t go wrong with one of WalletHub’s top picks. And if you’re interested in learning more about Fifth Third Truly Simple, you can find everything you need to know below. 0% Intro Rates for 15 Months: This applies to purchases and balance transfers alike, and it’s very good in both cases. For context, the average 0% credit card gives you 10 months before regular rates take effect. And the average balance transfer card gives you 0% for a bit more than 12 months. No Annual Fee: Most 0% credit cards don’t charge annual fees, which makes sense considering that a fee is just interest in different packaging. But this does save you $17.35 per year compared to the average credit card, market wide. Only Available in 10 States: You can only get the Truly Simple from Fifth Third Bank Card if you live in one of these states: Georgia, Florida, Illinois, Indiana, Kentucky, Michigan, North Carolina, Ohio, Tennessee and West Virginia.If that doesn’t describe you, don’t worry: There are plenty of other great 0% credit cards available. 4% Balance Transfer Fee: If you transfer a balance to the Truly Simple Mastercard, you’ll have to pay a fee equal to 4% of the amount transferred or $5, whichever is greater. That means the average household, which has roughly $8,000 in credit card debt, would have to pay $320 for the pleasure of not paying interest for the first 15 months. And considering the average balance transfer fee is only slightly above 2.5%, you should be able to do better. No Rewards: You don’t want to use the same credit card for making everyday purchases and carrying a balance from month to month. Doing so just raises the cost of your debt and decreases your chances of getting the best terms on both types of transactions. So the fact that Fifth Third Truly Simple doesn’t offer rewards isn’t too big of a deal. High Regular APR Possible: Truly Simple’s regular APR is advertised as a range: 14.24% - 25.24% (V). The exact rate you receive depends on your overall creditworthiness. So it’s helpful to consider how the possibilities stack up against the average for each credit category. People with excellent credit pay 14.41%, on average. And people with good credit pay about 20.31%. That means you’re likely to overpay on interest if you carry a balance from month to month with the Truly Simple Card, once its 0% intro rate is over. Good or Excellent Credit Required: We recommend a score of 700+ if you want reasonable odds of approval. You can check your latest credit score for free on WalletHub, the only site with free daily updates. Undisclosed Minimum Credit Limit: You can’t really count on using Truly Simple for a purchase or balance transfer of a certain amount because you’ll have no idea what your credit limit will be before account approval. Some cards list a minimum spending limit in their terms and conditions. There are lots of great 0% APR credit cards on the market right now. Below, you can see how the Fifth Third Truly Simple Card measures up. Ultimately, it should be clear that if you need more than 15 months to pay off a big-ticket purchase or are planning to transfer a balance, you’ll save more with one of Truly Simple’s top competitors.